Everyone knows about Facebook and Twitter, and even the smallest business owners tend to feel like they have a pretty good idea what they are doing on the two biggest social media platforms. But, some social media isn’t as easy to understand as the two giants. Instagram poses an especially difficulty problem for many business owners, who haven’t been able to figure out how you can turn a pictures and hashtag only platform into brand building and customer outreach. You can do just that, if you take the time to understand Instagram and who is using the site. Once you’ve gotten down the basic features, you’ll find yourself sharing pictures and videos to thousands of followers in no time. Alexandra Burnett has some tips to help you get started. Complete Your Profile – Just as in real life, first impressions matter. Your profile is your chance to leave a good first impression by showing viewers who you are and what you do. It also won’t ever hurt to include a link to your Facebook or Twitter page and website. This way, any prospective customers can easily find out more about what you offer. Find Your Customers – You should have a pretty good idea what your demographic is by this point. If you don’t, start basic by looking for those in your city (#Tulsa) or share interests relevant to your market (#soccer). These people are all prospective leads. It is up to you to look for them and interact with them. Be Engaging – Don’t be afraid to make the first move. Reach out to everyone you can. Tag others, talk to those who reach out to you, show support for your community, and use your location. Everything you can to flesh out your online identity will help reaffirm to your viewers that you are the real deal. Be Consistent, but Don’t Be Spammy – It is important to post regularly. If followers notice you haven’t been posting, they may be inclined to unfollow you. The catch is, you have to show some restraint. Any more than a few posts a day is overkill. Try to set a limit of 2-3 at most. Show Off Your Products – Everyone loves to window shop, and Instagram is a great platform for consumers to idly browse for things they like. Highlight new products, and show off your services. If users are following you, chances are they want to know more about your businesses and what you offer. Make It Personal – Humanize your business by showing off the people who make it all work. Introducing employees to the public puts a face to your brand and shows you care about everyone involved. Last week, Apple announced their new iPads, the iPad Air, a thinner, lighter, and more powerful version of their full-size tablet, as well as an updated iPad mini with Retina Display. The broad public response to Apple’s latest products seems to be underwhelming, but it hasn’t seemed to sway how popular Apple products are with consumers. The day of Apple’s big announcement, ad network Chitika released their analysis of tablet traffic from North America, and it appears the negative market analysis has done little to diminish Apple’s grip on mobile traffic. The iPhone owned mobile traffic through the entire rise of smartphones, and now it seems the iPad has just as strong of a stranglehold on tablet traffic, raking in 81 percent of the market. According to Marketing Land, this is actually a decrease from their 84 percent traffic share in June, but Chitika says no other single competitor has directly benefited. Their traffic may be down, but not a remarkable level by any means. Recent data from the Pew Research Center says that 35 percent of Americans over the age of 16 own a tablet, and clearly the iPad is the most popular option for browsing the internet. 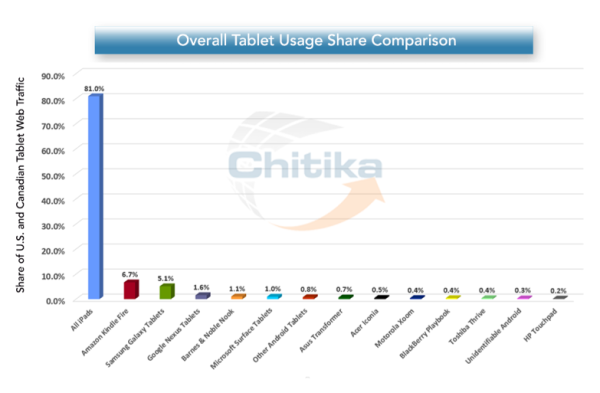 However, the Kindle has proven to be the most successful Android tablet in North America, so it may be that consumers are simply choosing the tablet most suited for their needs: e-books or the internet. Why Do You Need A Designer and a Developer For Your Site? Most people may not know this, but web design has two distinct sides. You’ll notice this when you begin to build a site and learn you need to hire a designer and a web developer, or one of those rare few who are great at both. But, what does this actually mean? 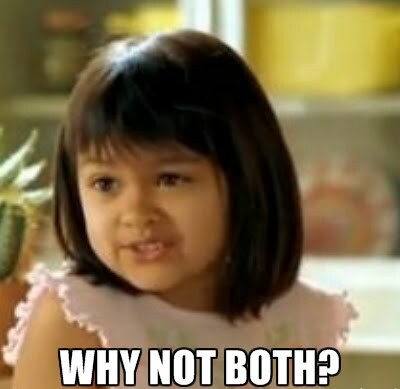 Why do you need two separate people to build one site? To understand why web design has these two distinct facets, you have to understand the basics of how a site is created. A web designer creates the look and style of your page using graphics and design software such as Photoshop. But, this design isn’t a functional site. To bring everything to life, the design has to be coupled with code. The designer is generally considered to be creative side of the team. Their job is to work with the client to dream up a look and feel that matches the brand. These are the artists who you imagine working to create a website. A web designer succeeding in the current market will be able to tell you all about color and typography, the importance of spacial relationships, and how these effect your audience. This is the technical side of the creation process. These people usually have a degree in computer science or programming, and are very technologically minded. While a designer may be creative, a developer will likely be more detail-oriented. While these sound like separate jobs, they are both working towards the same goal. You can’t have one without the other. But do you really need two separate people for this? In the current market, the answer is most often yes. While many designers are relatively informed on coding, and developers are aware of the creative process establishing the look of the site, these are both complex jobs which require specialized talents. There are those who bill themselves as both, and many are perfectly capable of building an entire site by themselves. However, these are few and far in between. The best designers and developers have read up on the other side of the process, and may even have a fair amount of technical skill. But, you’ll benefit from building a team instead. The extra set of eyes will spot any flaws before resources are invested in the wrong areas, and you’ll have someone specially suited for sides on either side of the aisle. Max https://www.tulsamarketingonline.com/wp-content/uploads/2018/07/TMO-Logo.png Max2013-10-29 15:18:412013-10-29 15:18:41Why Do You Need A Designer and a Developer For Your Site? If there is one way to concisely explain the changes Google’s search algorithms have gone through in the past couple years, it would boil down to “bigger is not always better.” Gone are the days that you can jam as many keywords as you could fit into a paragraph of text, or buy up countless thousands of links and hope to rank highly. However, the more you do to offer quality content and information to your users while staying in line with Google’s practices, the more success you’ll see. Those two ideas are fairly common knowledge now, but they have created their own fair share of questions. Where should the balance between quantity and quality lie? How is this content evaluated? Does quantity of content outweigh quality of content? Google has given some insight into how content is evaluated in the past, and it is clear that you won’t get far with an excessive amount of paper-thin content. Still, the number of indexed pages your site has does indeed have an effect on your ranking. So how exactly does this work and what is the balance? However, having more indexed pages does have some clear benefits. The more pages you have, the more opportunities you have to rank for different keywords. But, this is only because you should be covering a larger variety of keywords and topics across that larger group of pages. A larger number of indexed pages is also likely to improve your overall links and PageRank, which can affect your ranking. But, the link isn’t direct. Simply having more pages won’t improve much for you. Instead, you have to use those extra pages to deliver valuable content and information to your users. If you’re just filling your site with a meaningless wealth of pages to be indexed, you won’t be seeing any improvement anytime soon. Could Bing Ads Be Better For Small Businesses? Just as with search, when we talk about PPC advertising, we almost naturally shift the majority of our attention to Google and their AdWords advertising platform. It makes sense on the surface, Google receives a significantly higher volume of search than other engines and even higher CTRs. But, some marketing analysts are beginning to believe it may be more effective to put an emphasis on Bing ads, especially if you are advertising for a small business. 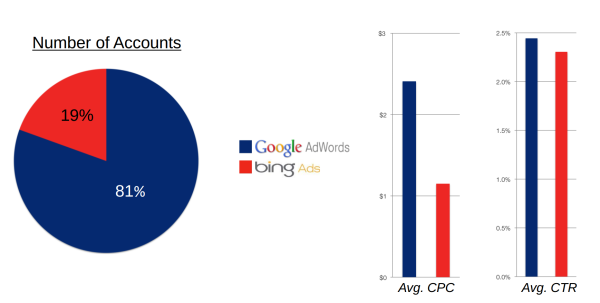 Pricing Engine, a small business marketing platform, has found that Bing ads are “more efficient” than AdWords, as they become a lower cost source of leads for small businesses. As Search Engine Land reported, Pricing Engine examined their own data from hundreds of accounts, and they found that CTRs were indeed marginally higher on Google, but CPCs were significantly higher. As such, it seems that you actually get more for your dollar with Bing ads. Big brands will still favor the higher volume of searches on Google, but smaller businesses don’t require the same kind of scale. Investing in marketing with a better return per cost may pay off in the long run. Max https://www.tulsamarketingonline.com/wp-content/uploads/2018/07/TMO-Logo.png Max2013-10-28 15:58:322013-10-28 15:58:32Could Bing Ads Be Better For Small Businesses? Last week some people began noticing that large banner ads were appearing on Google for a select few branded search results. This test of huge banner ads has caused quite a bit of a stir across the internet, especially because it seems to break a promise Google made all the way back in 2005. One could argue that some of the Google Doodle homepage logos commemorating special events would qualify as “crazy, flashy, graphical doodads”, those have never caused any worry because they are simply a flourish added to the homepage logo. However, it is indisputable that the new ad tests Google is running breaks their “no banner ads” promise outright. But, is it a bad thing? The most notable aspect of the banner ads is that they only appear for branded searches. That means, if you search for Crate & Barrel, you might be shown the banner for Crate & Barrel. You won’t, however, be seeing any ads for random companies unrelated to your search, as you would normally associate with the term ‘banner ad’. These ads are also linked to the brand’s website, providing users with an obvious, visually pleasing way to immediately find the business they are looking for. With careful moderation of banners, they could potentially allow businesses to essentially own their branded searches. One of the biggest concerns for consumers regarding these ads is how they are used. Few users will be upset for the easily identifiable link with an aesthetically pleasing image showing when they search for a specific brand. However, if this test expands and advertisers are ever allowed to use these banners to advertise sales or other more advertising-styled banners, there may be a backlash. Currently, it is estimated that 30 advertisers are currently being involved in the test, including Southwest Airlines, Virgin America, and Crate & Barrel. The test banner ads are also only being shown for 5 percent or less of search queries, so it is entirely possible you won’t run into one for quite a while. Now that the dust has settled after some extended debate, it seems clear that responsive design is here to stay. It won’t last forever, but it certainly isn’t a flashy trend that is going to fade away soon. It makes sense responsive design would catch on like it has, as it makes designing for the multitude of devices used to access the internet much easier than ever before. Almost as many people accessing the internet right this moment are doing so using a smartphone or tablet, but they aren’t all using the same devices. A normal website designed to look great on a desktop won’t look good on a smartphone, but similarly a site designed to work well on the new iPhone won’t have the same results on a Galaxy Note 3. This problem has two feasible solutions for designers. Either you can design multiple versions of a website, so that there is a workable option for smartphones, tablets, and desktops, or you can create a responsive website which will look good on every device. Both options require you to test your site on numerous devices to ensure it actually works great across the board, but a responsive site means you only have to actually design one site. The rest of the work is in the tweaking to optimize the site for individual devices. That all explains why designers love responsive design as a solution for the greatly expanding internet browsing options, but we have to please other people with our designs as well. Thankfully, responsive design has benefits for everyone involved. The design solution is even great for search engine optimization, which is normally not the case with design and optimization working together. Saurabh Tyagi explains how responsive design benefits SEO as much as it does consumers. SEO professionals spend a lot of their time and efforts simply trying to appease the Google Gods, or trying to follow the current best practices while also managing to outplay their competition. Google has officially included responsive design into its best practice guidelines, as well as issuing public statements calling for websites to adopt the design strategy, so naturally SEOs have come to love it. One of the biggest reasons Google loves responsive sites is that it allows websites to use the same URL for a mobile site as they do for a desktop site, instead of redirecting users. A site with separate URLs will have a harder time gaining in the rankings than one with a single functional URL. 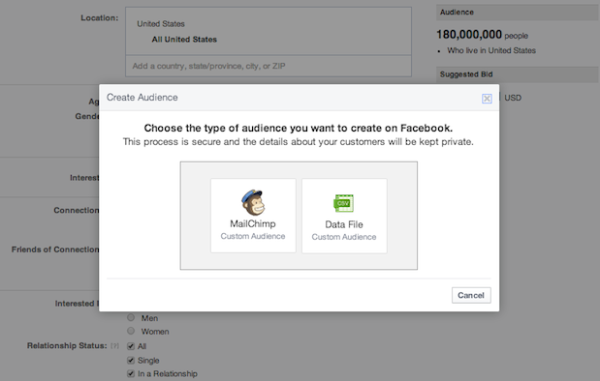 Getting users to stay on your page is actually easier than you might think. If you represent yourself honestly to search engines, and offer a functional, readable, and generally enjoyable website, users that click on your page are likely to stay there. By ensuring your website is functional and enjoyable on nearly every device, you ensure users are less likely to hit the back button. Having a separate mobile site from your desktop site means double the SEO work. Optimization is neither cheap, fast, or easy, so it doesn’t make sense to waste all that extra time and work on basically duplicate efforts. Instead of having to optimize two sites, responsive websites allow SEOs to put all their efforts into one site, saving you money and providing a more focused optimization effort. When you’re having to manage running two sites for the same business, it is highly likely you will eventually end up accidentally placing duplicate content on one of the sites. If this becomes a regular problem, you can expect punishments from search engines which could be easily avoidable by simply having one site. Responsive design also makes it easier to direct users to the right content. One of Google’s biggest mobile pet peeves of the moment is the practice of consistently redirecting mobile users to the front page of the mobile site, rather than to the mobile version of the content they asked for. Responsive design avoids these types of issues altogether. If you’ve spent much time online in the past year or two, it is almost certain you’ve come across an infographic. They are highly enjoyed by the public, as well as being educational. This is why more companies and content creators are using infographics to communicate and share knowledge with the public than ever before. Some may say it is just a trend, but either way the data shows that searches for infographics have risen over 800 percent in just two years, from 2010 to 2012. Even if you don’t know what an infographic is, the chances still favor that you have seen one either in your Facebook feed, a news article, or maybe even your email. Infographics are images intended to share information, data, or knowledge in a quick and easily comprehensible way. They turn boring information into interesting visuals which not only make the information easier to understand, but also make the average viewer more interested in what is being communicated. According to Albert Costill, multiple studies have found that 90 percent of the information we retain and remember is based on visual impact. Considering how much information take in on a day to day basis, and that means you’re content should be visually impressive if you want to have a hope of viewers remembering it. If you’re still unsure about infographics, there are several reasons you should consider at least including them occasionally within your content strategy. Infographics are naturally more eye-catching than printed words, and a well laid-out infographic will catch viewers attention in ways standard text can’t. You’re free to use more images, colors, and even movement which are more immediately visually appealing. The average online reader tends to scan text rather than reading every single word. Infographics combat this tendency by making viewers more likely to engage all of the information on the screen, but they also make it easier for those who still scan to find the information most important to them. Infographics are more easily sharable than most other types of content. Most social networks are image friendly, so users are given two very simple ways to show their friends their favorite infographics. Readers can share a link directly to your site, or they can save the image and share it directly. The more easily content can be shared, the more likely it is to go viral. Infographics can subliminally help reinforce your brand image, so long as you are consistent. Using consistent colors, shapes, and messages, combined with your logo all work to raise your brand awareness. 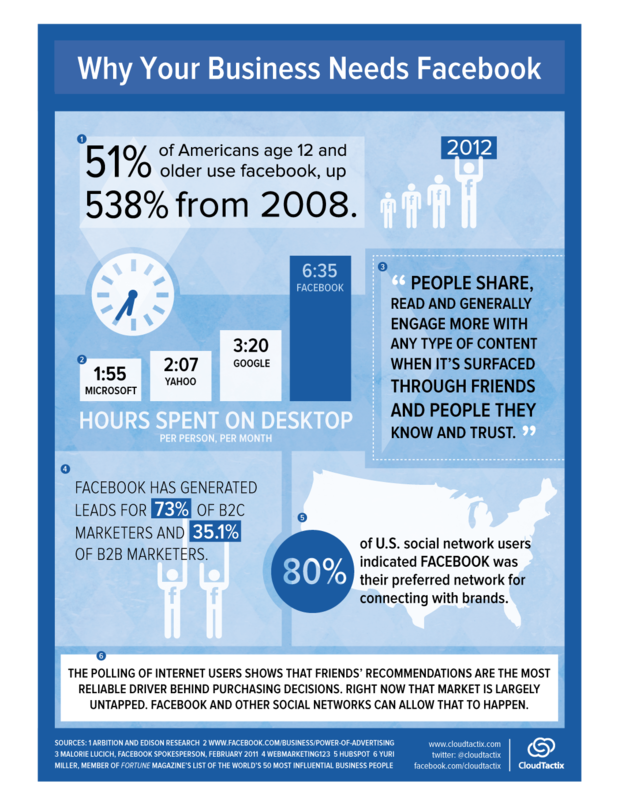 You can see how well this works when you notice that every infographic relating to Facebook naturally uses “Facebook Blue” and reflects the style of their brand. Obviously you shouldn’t be putting out an infographic every day. Blog posts still have their place in any content strategy. Plus, if you are creating infographics daily, it is likely their quality will suffer. Treat infographics as a tool that can be reserved for special occasions or pulled out when necessary. With the right balance, you’ll find your infographics can be more powerful and popular than you ever imagined. You might not have noticed, but AdWords is working a little different since an algorithm update was quietly introduced on Tuesday. For the most part, not much is different, but there is a notable change in the ad extensions are now working as a factor in determining as positioning. The update was announced in a blog which details all of the parts of the update. But, the big takeaway is that AdWords was updated mainly to take into account the new features that have rolled out over the past year. Ad extensions now have an affect of how ads are positioned in Google’s search results. To show how this is working, Google gave the example of two identical ads with the same bid and quality score. With the update, the ad with extensions is more likely to appear in the higher ad position. You may also see that a higher quality score, bid, or a combination of both also increases the likelihood of extensions appearing. Ad Rank also plays a similar role in deciding whether extensions appear.